Beautiful single bed frame and mattress package. Stunning pearl silver finish combined with the elegant design give the Chatsworth bed frame a classic feel with a timeless appeal. The Premier mattress is 18cm deep, coil sprung with medium firmness. The cover is made from damask material. This mattress conforms to UK fire flammability regulations. Mattress care Instructions: Turn mattress regularly - do not bend or fold. Ideal for use by children or for guest use. 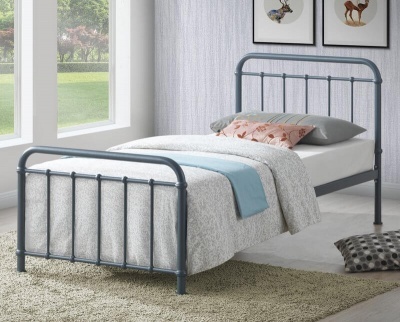 Bed frame: H108 W95 L201 cm. Premier mattress: L190 W91.5 D18 cm.